CARB LOAD!!!! That’s what I have been doing for a couple of weeks now. Actually, I carb load all the time. It’s part of my life. What a great way to get in the carbs. 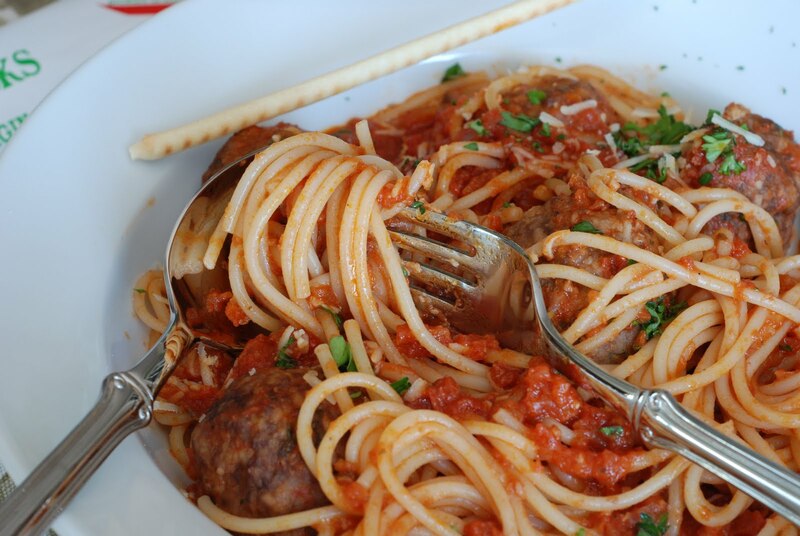 Spahetti cooked al denta smothered in red sauce with big old meatballs. Fabulous. 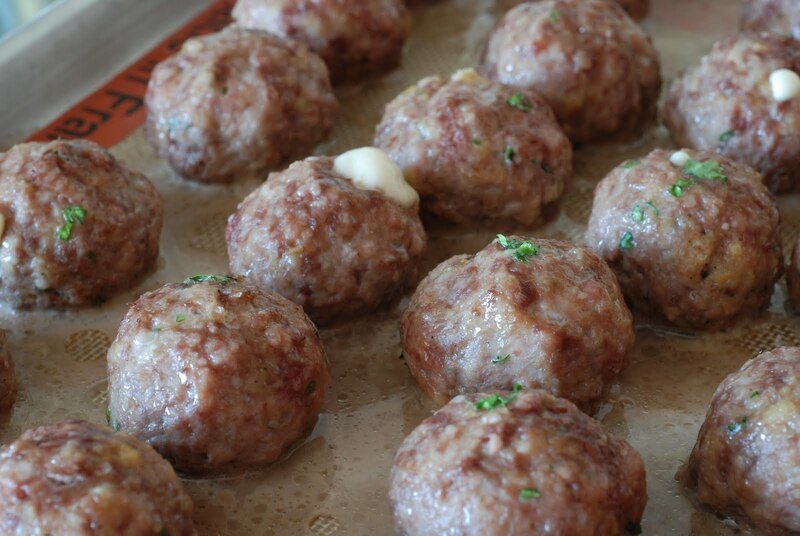 These are not your ordinary meatballs, they are stuffed with fresh mozzarella cheese. That was Ryan’s idea. A very good idea I must admit. I hope you are appreciating this post. Because I have had one crazy day trying to get it posted. I had to color my hair (number one on the list), attend a bridal shower (just ended up taking by a gift, sorry Leigh), play with grandkids (so worth it), get a pre-race massage (HAD TO) THEN catch up on “Project Runway”. I have a plane to catch to Boston in about 9 hours. I need to do some final packing and then get 10 hours of sleep. So why am I taking the time to tell you all this??? 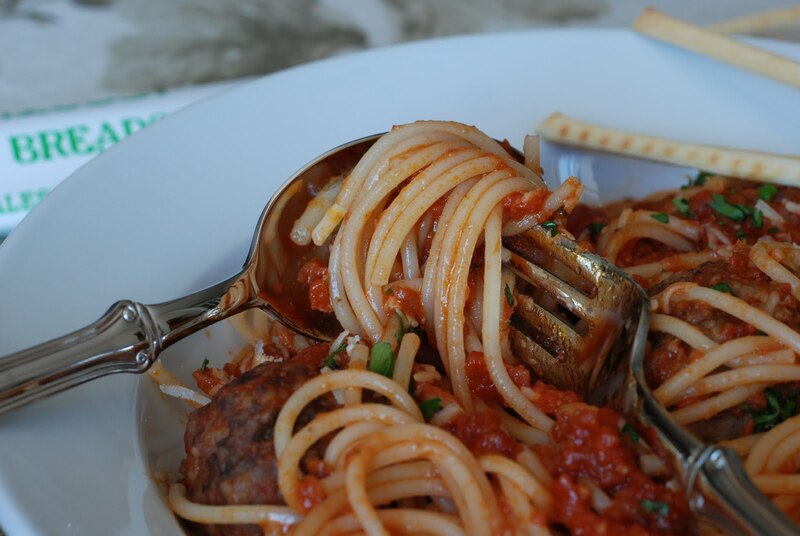 I love Ina Garten and I based this recipe off of her “Real Meatballs & Spaghetti”. I’m giving Ina the credit with the exception of the stuffed meatball. Ryan gets the kudos for that idea. 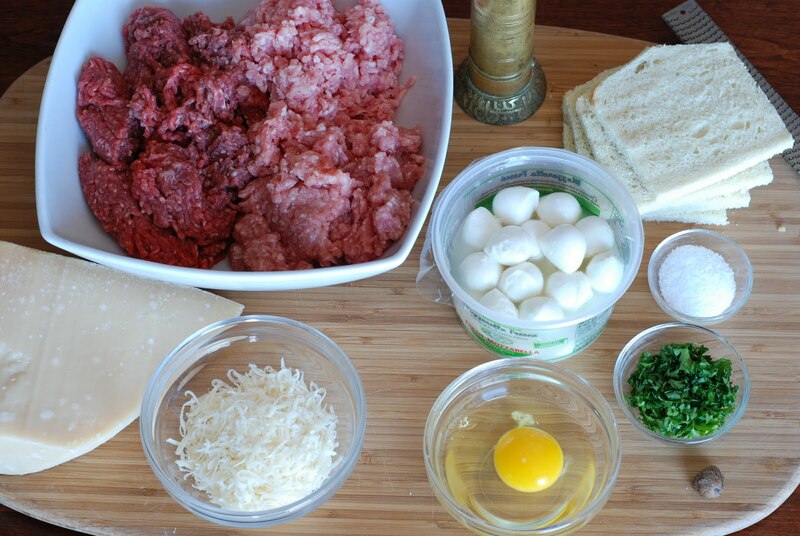 This recipe calls for 1 pound of ground beef, 1/2 pound of ground pork and 1/2 pound ground veal. This is an awesome combination and I didn’t have any trouble locating the three at my local grocery store (that would NOT be “Smiths”). 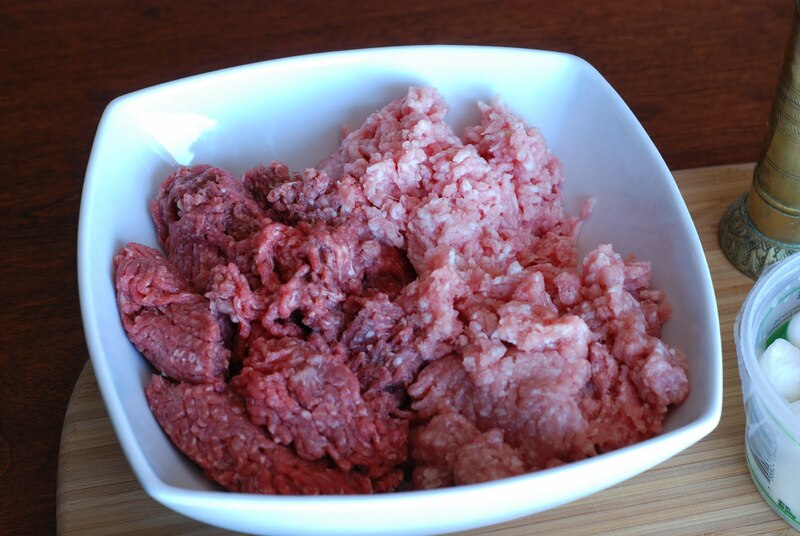 If you don’t want to bother with the pork or veal, by all means use 2 pounds of ground beef. Use the leanest you can find. Take a fork and lightly combine the three meats. You don’t want to over mix this. Don’t squish it through your hands. Just lightly mix the three together. 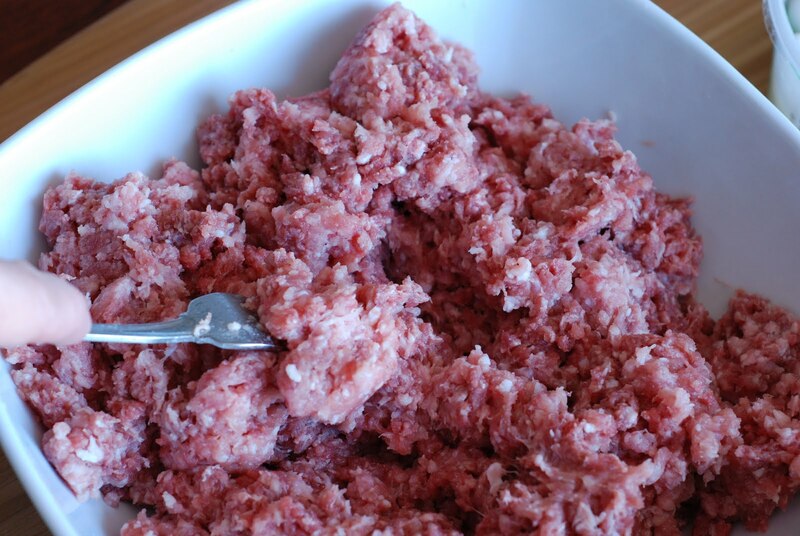 This is what you are going to add to your ground meats. Parmesan (NOT from a can), an egg, fresh chopped parsley, 4 slices of white bread that have the crusts removed and ground into bread crumbs, freshly grated nutmeg, salt and fresh ground pepper. This is what I use to make bread crumbs. You can use a blender and pulse to make your bread crumbs. This is my baby. I have four Cuisinart food processors, but this one is my baby and it’s that one that my husband gave to me to show me just how much he loves me. It worked. LOVE IT! Williams-Sonoma…hint, hint…mother’s day. Pulse a few times and you have instant bread crumbs. I like using fresh for this recipe. combine the ingredients. You want to mix them in well, but gently. Ooo that’s fresh nutmeg. LOVE IT! I almost forgot a VERY important ingredient. Pour in 3/4 cup warm water. 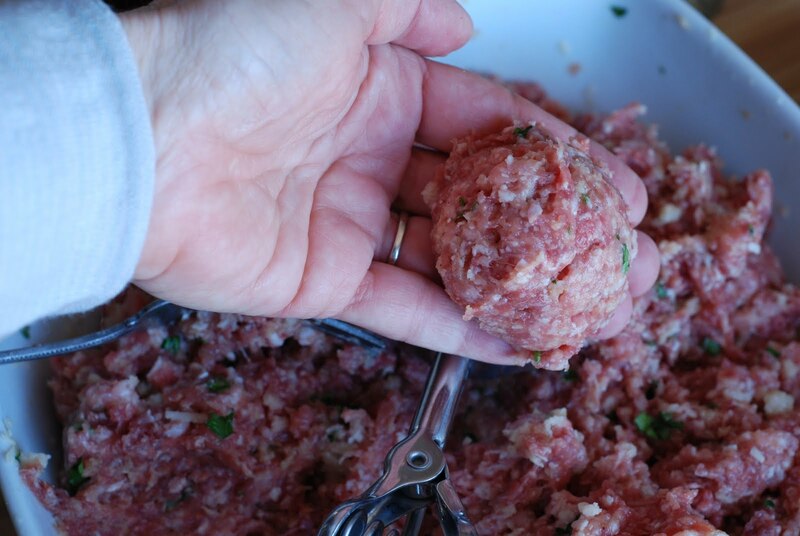 This is the secret that makes the meatballs, oh so tender and juicy. Gently mixing with my fork. 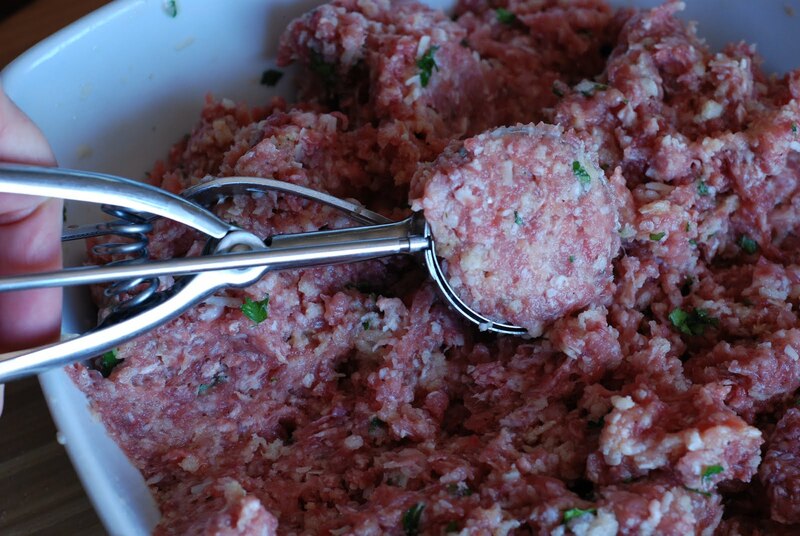 Pack in the meatball mixture. 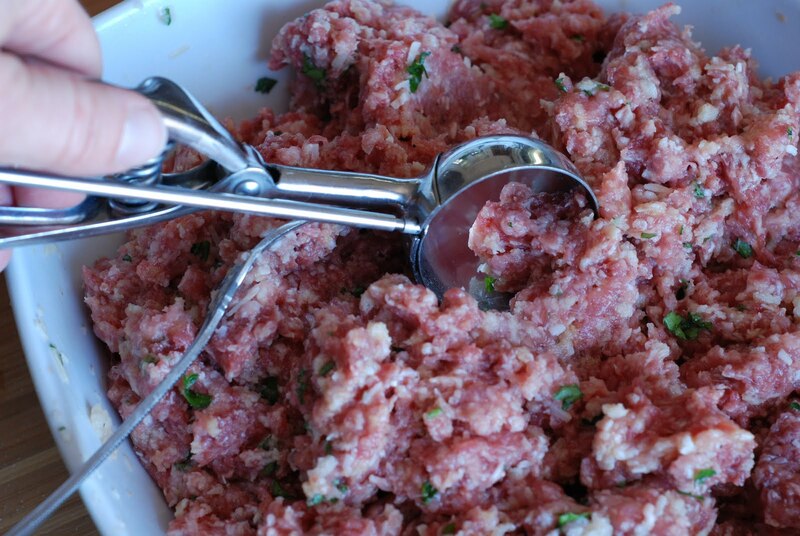 I like to use an ice cream scoop to form the meatballs. It keeps them uniform. This is the same scoop I use for cookies, which holds about 2 tablespoons. Release the mixture into your hand. 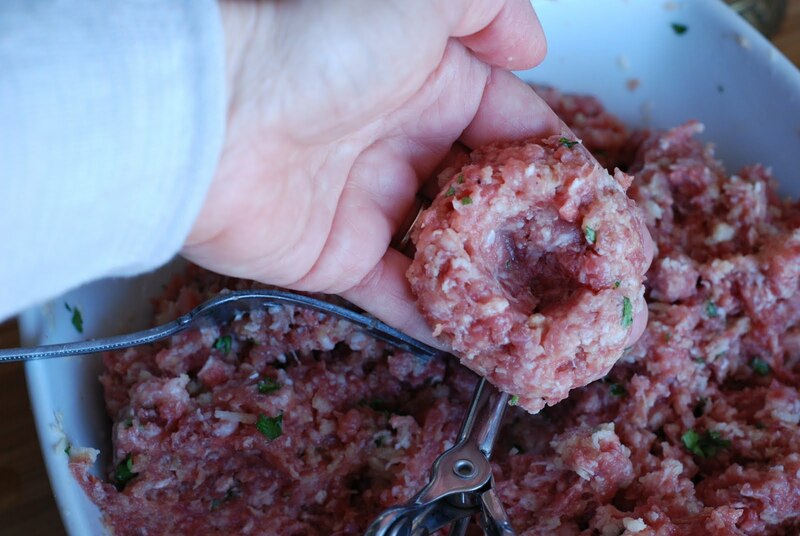 Make a hole in the center of the meatball. Place a piece of the mozzarella in the middle. The mozzarella that I purchased was a cherry sized fresh mozzarella ball. It came packed in liquid in an 8 ounce container. Just cover up the mozzarella ball. Be sure to seal it up well so that the cheese doesn’t ooze out. 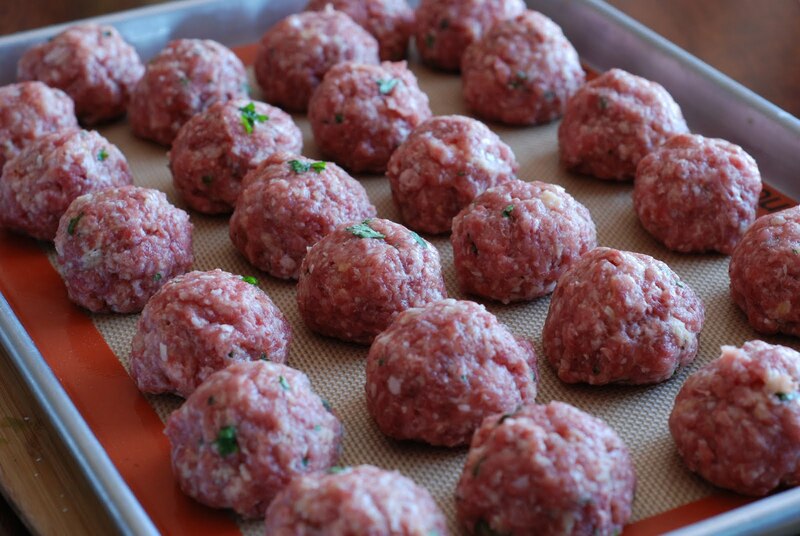 I line the meatballs up on a silpat (Thanks Trudy) lined baking sheet. At this point to you two options. One you can just put this baking sheet into a preheated 350 degree oven for 15 minutes and bake the meatballs. OR you can saute them in a skillet in about 1/4-inch oil until they are browned. The problem that I have with the pan fry method is that I end up with triangular shaped meatballs. When I bake them the maintain their shape and look prettier. HOWEVER I think I like the flavor of the sauteed meatballs better than the baked ones. 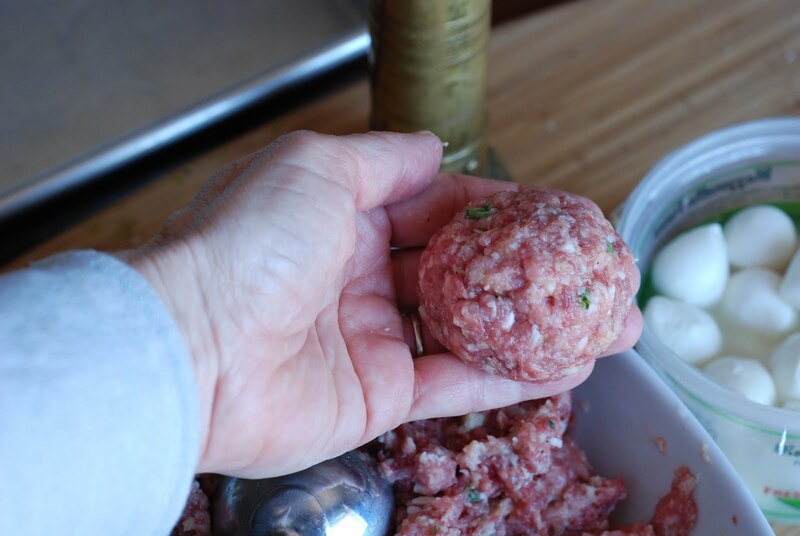 I chose the oven method so you could see how nice and round the meatballs turn out. You choose. Bake the meatballs for about 15 minutes. You do not want the completely cooked through. They will finish cooking in the sauce. Just set them aside while you make the sauce OR you can put them in a freezer bag and freeze them for later use. The sauce is super easy to make. 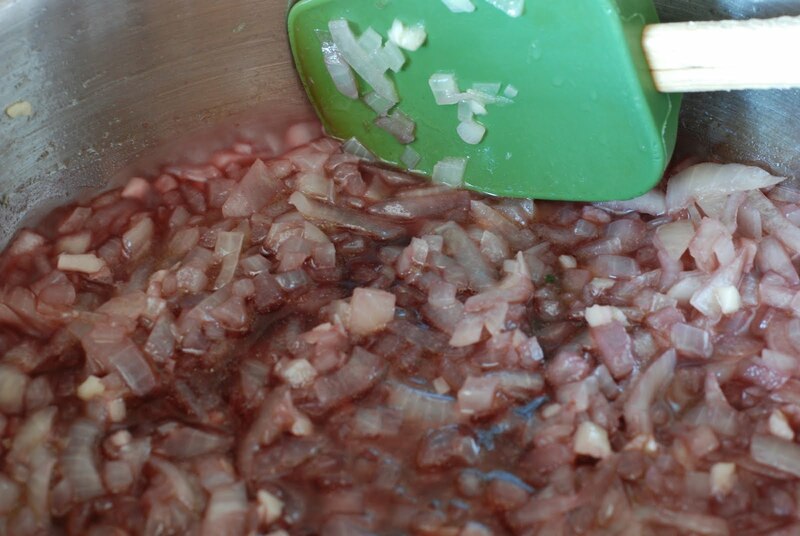 You will need one large onion, two cloves garlic, 1 can crushed tomatoes, olive oil, red wine (if you don’t want to use the wine, just omit it) and freshly chopped parsley. Pour about a tablespoon or so of extra virgin olive oil into a large pan. Add the onions and saute them until translucent. About 5-8 minutes. Add the red wine. I use dealcholized that I purchase at my local grocery store (NOT Smith’s). Turn the heat up and simmer until the wine is almost completely cooked out. Omit this step if you are not using wine. …and fresh ground pepper. Stir together and bring to a simmer. 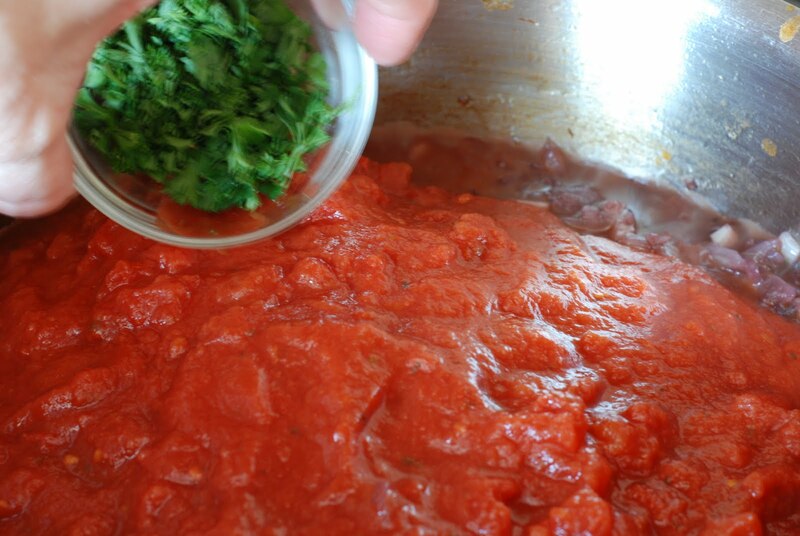 Add the partially cooked meatballs to the sauce. Cover with a lid and simmer for 25-30 minutes over low heat. 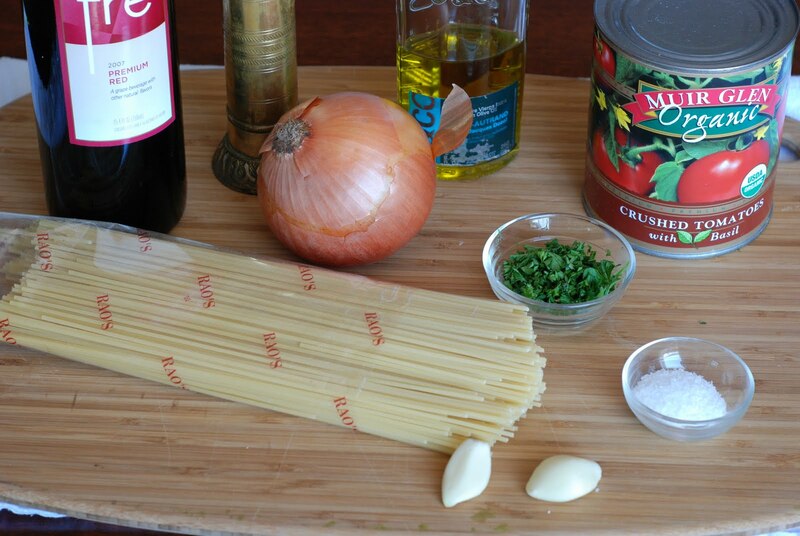 Add your precooked spaghetti. 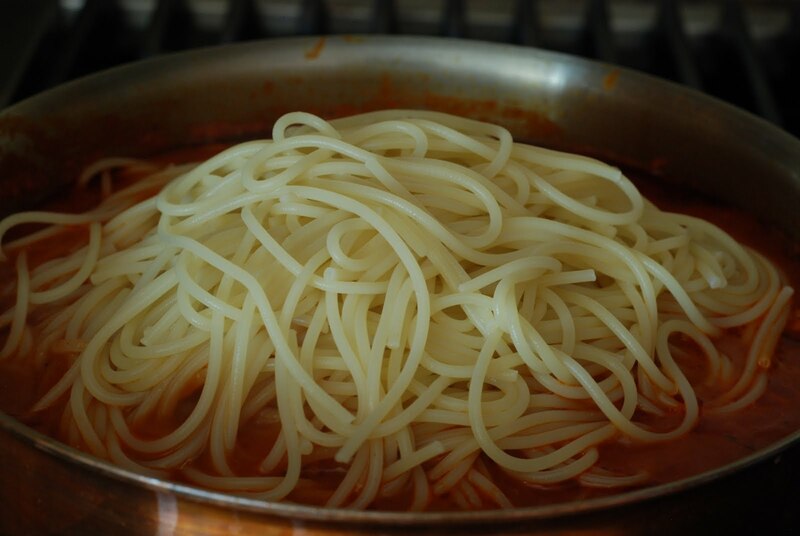 Remember to cook al dente, which means to look until it still has some bite to it. 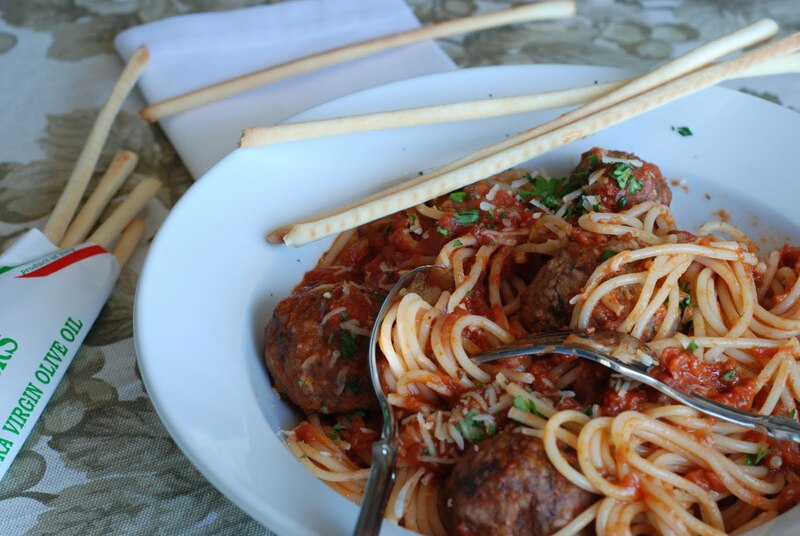 Gently toss the noodles with the sauce and meatballs. Bring back to a simmer. 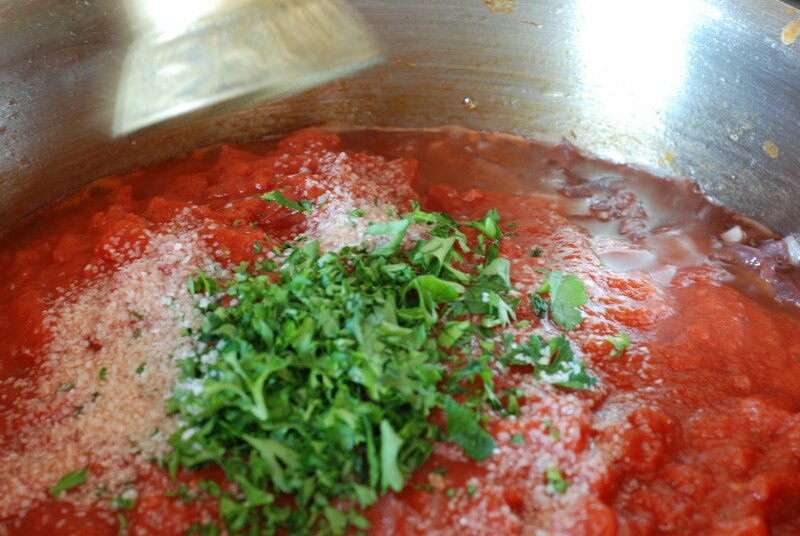 I like to put my pasta into the sauce and let it simmer, because the pasta aborbs the sauce giving it more flavor. 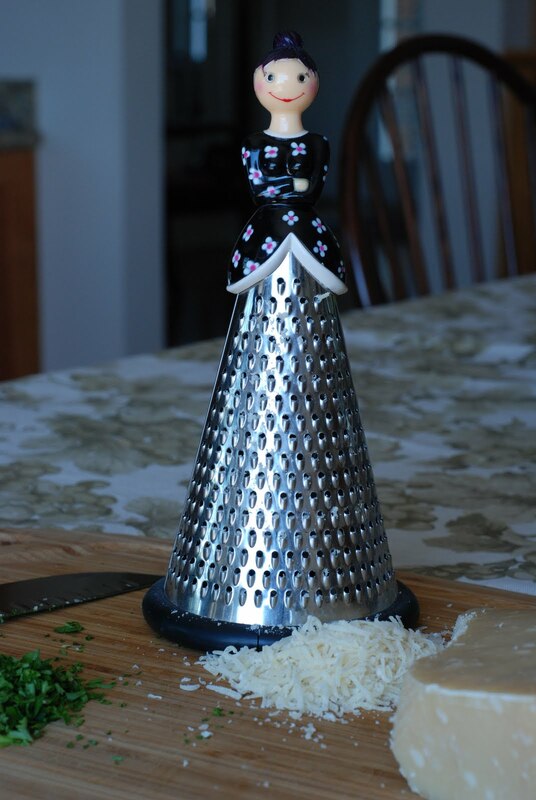 Be sure to grate plenty of parmesan to pass around. I know – CUTE! Got it in Paris. Lucky me. Serve it up while it’s piping hot. 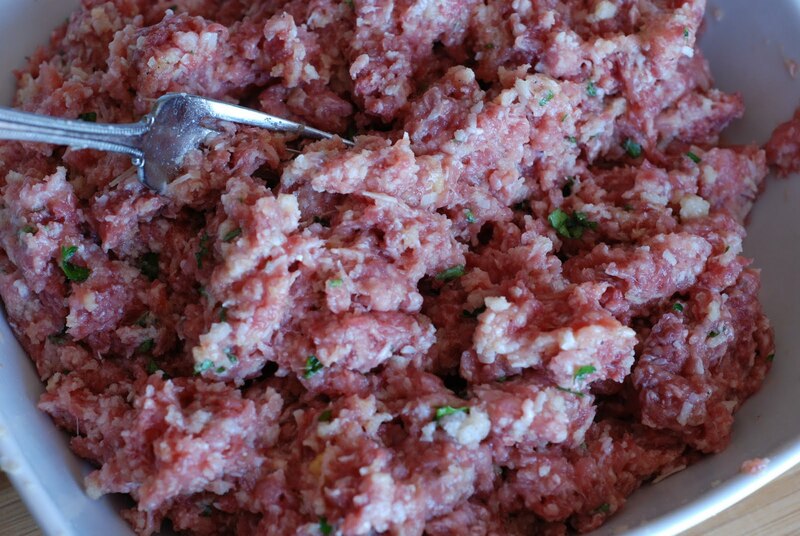 Place the ground meats, bread crumbs, parsley, Parmesan, salt, pepper, nutmeg, egg, and 3/4 cup warm water in a bowl. combine very lightly with a fork. using an ice cream scoop form mixture into balls. 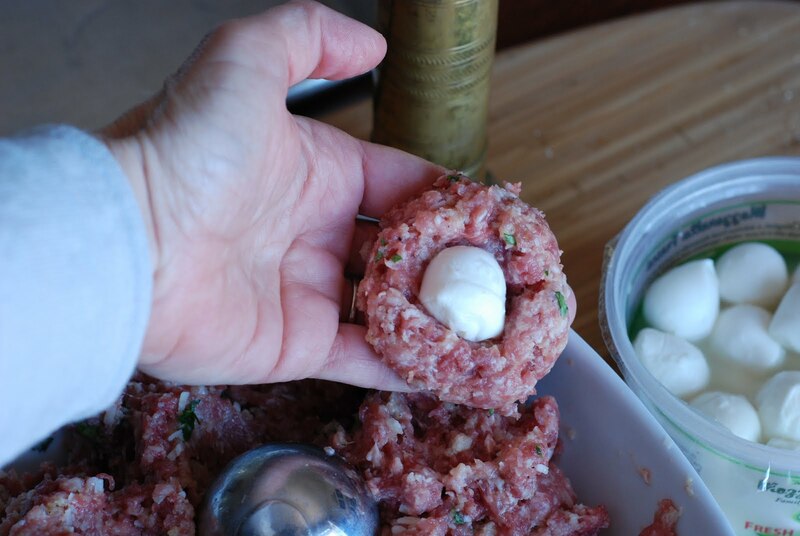 Make an indention with your thumb in the ball and place a small cherry size ball of fresh mozzarella. Cover with meat mixture and seal around cheese so it doesn’t ooze out. make in a preheated 350 degree oven for 15 minutes. Or saute in a skillet in 1/4 -inch oil until browned, but not completely cooked. Heat the olive oil in a pan. 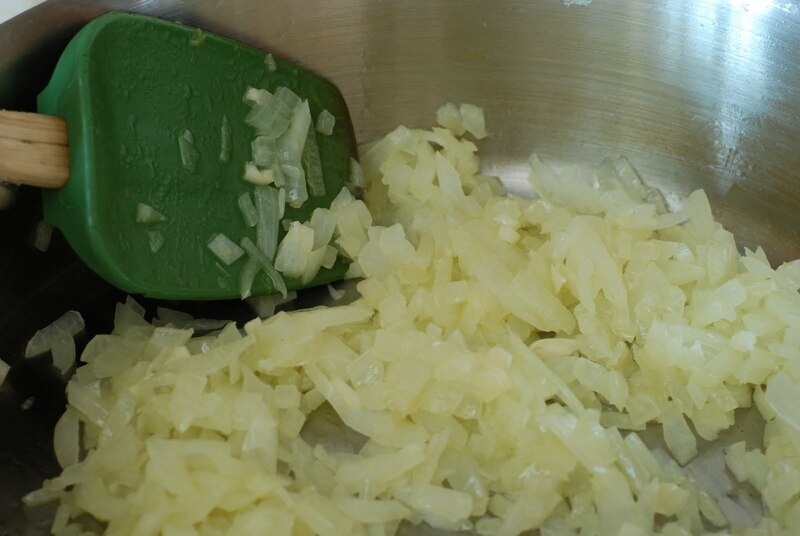 Add the onion and sauté over medium heat for 5-8 minutes or until translucent. Add the garlic and cook for 1 more minute. 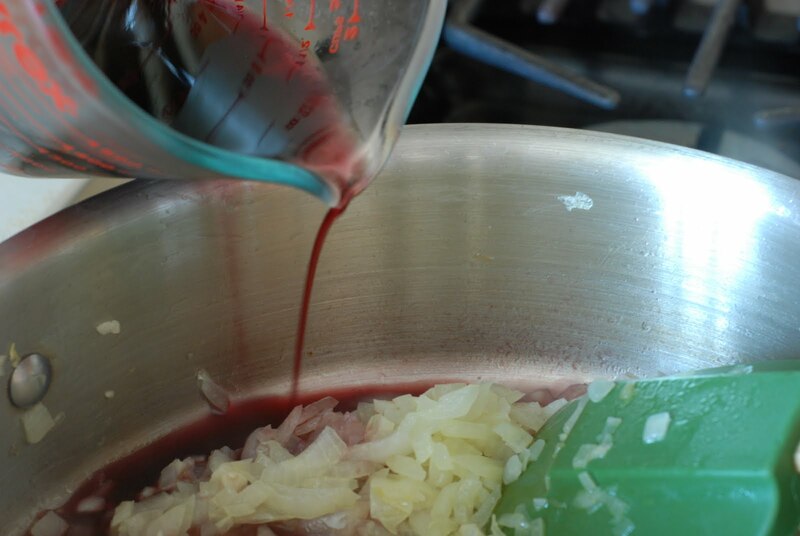 Add the wine and cook on high heat, until almost all the liquid evaporates. 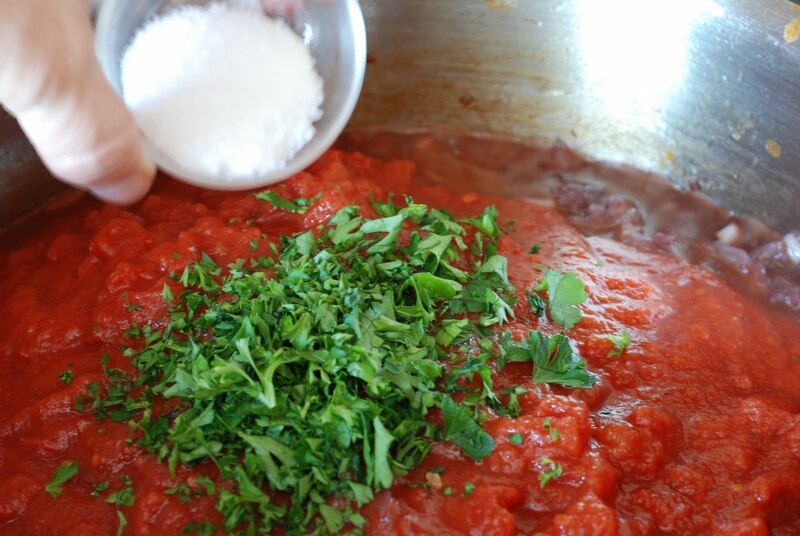 Stir in the tomatoes, parsley, salt and pepper. 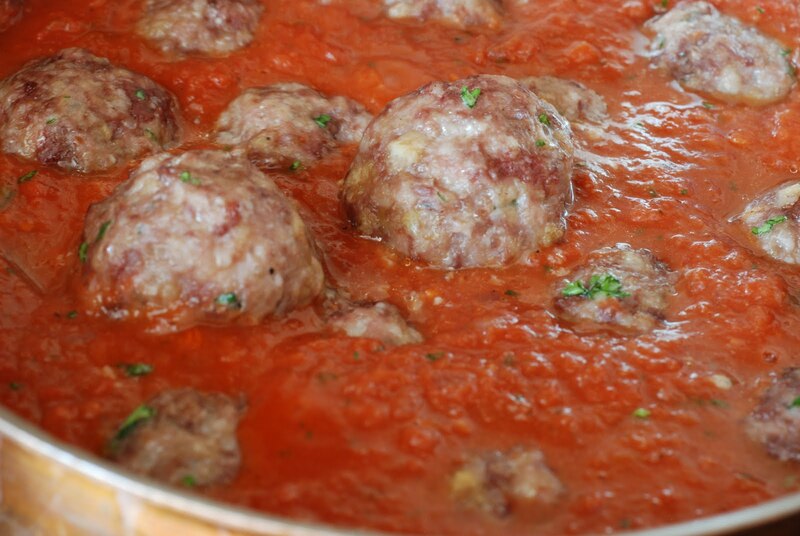 Return the meatballs to the sauce, cover, and simmer on the lowest heat for 25-30 minutes, until the meatballs are cooked through. 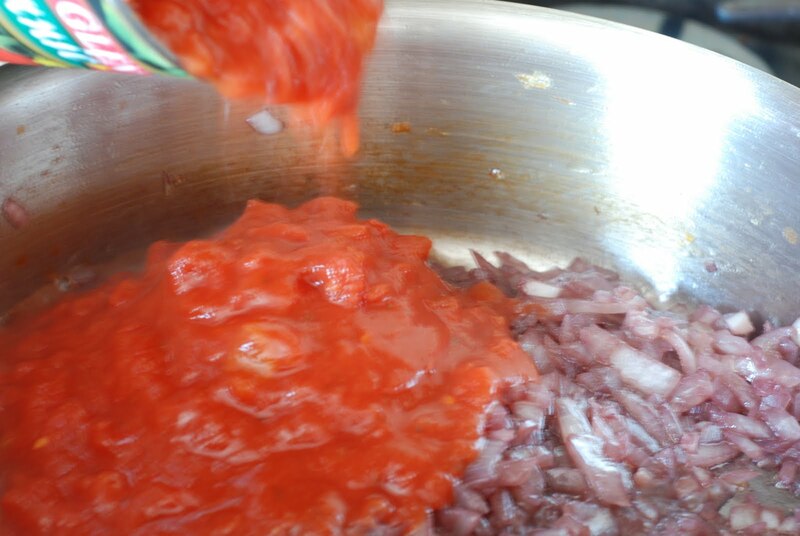 Add the cooked spaghetti to the sauce and gently stir. Bring to a simmer. Serve hot with Parmesan cheese. This will make 6 hearty servings. This is comfort food. Enjoy. This is a fabulous recipe. I cook it when I have friends or family over and they all love it! Great news! Thank you so much for your comment. Sounds absolutely wonderful! To cut down on the guilt, I mean Carbs, try using Dreamfield Pasta. Readily available in most supermarkets. Only 5 Carbs digested per cup of pasta. No funny tastes, REAL pasta but they prevent you from absorbing all those guilty Carbs. Advocated by the American Diabetic Society because it doesn't spike blood sugar. This is the best thing since buttered bread for those of us who can't eat a lot of Carbs! 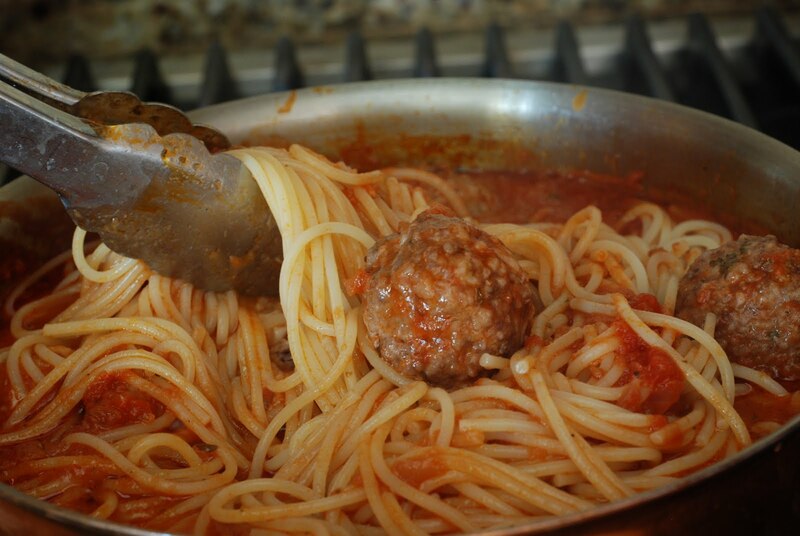 After I baked the meatballs I browned them in a hot skillet to get that yummy crust! That would add so much more flavor. Thanks for sharing. I'll keep the variety coming. I've missed blogging. I'll try to post in a couple of days. Beef and nutmeg are meant to be. This looks fantastic. 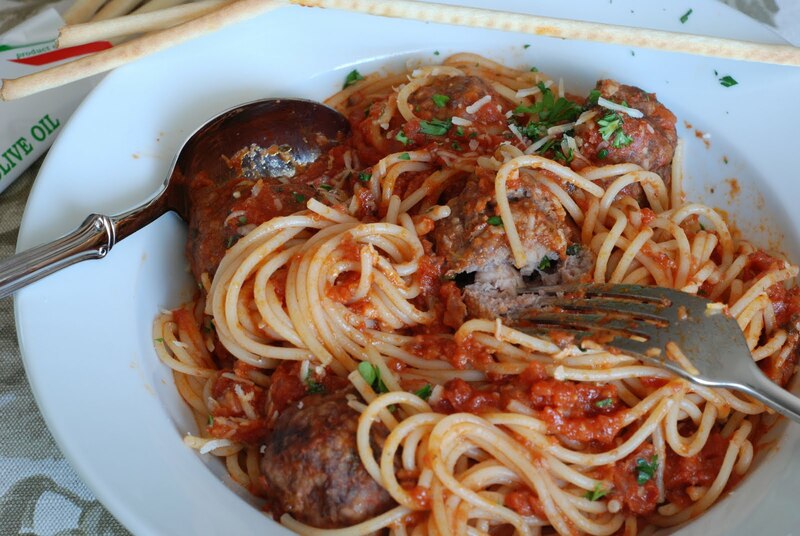 We had spaghetti and meatballs on the menu for this week anyway, so I'll try your recipe rather than go with the old standby. We are not routine diners–gimme VARIETY! Thanks for sharing your recipe even though you're SO busy!